Create a legally binding Massachusetts Bill of Sale with our attorney-drafted template! What Is a Massachusetts Bill of Sale? A Massachusetts bill of sale is a document that outlines the exchange of legal ownership between a person selling a personal belonging of some sort and the person who wishes to take possession of it. The parties are referred to as the buyer and the seller. In Massachusetts, there is no legal obligation to have a bill of sale notarized. The purpose of a bill of sale is to act as proof of ownership. While most transactions in Massachusetts don't require a bill of sale, it's still important to have one as a personal record. In the event of a legal dispute over the item or a theft, a Massachusetts bill of sale can help prove who the legal owner of the item is. What Are Some Common Bills of Sale Used in Massachusetts? The most commonly used bills of sale in Massachusetts are the general bill of sale, a bill of sale for a motor vehicle, a bill of sale for a boat, and a bill of sale for a gun. How Do I Write a Massachusetts Bill of Sale? You can write a Massachusetts bill of sale using plain English since there is no legal requirement to have one when you sell an item. However, using one can help you prove legal ownership of an item. When you write a Massachusetts bill of sale, you must include some common elements. Those elements cover information about the involved parties, a description of the property, the terms of the sale, and it must have the signature of both parties. How you describe the item being sold will depend on the type of Massachusetts bill of sale you need. Below, you'll learn how to each bill of sale is used and how you would describe the item for each one. First, though, we're going to detail the other information that belongs in every Massachusetts bill of sale. The two parties involved in a Massachusetts bill of sale are referred to as the buyer and the seller. The terms mean what you think they mean. The seller is the person who has an item for sale. The buyer is the person who is interested in owning the item. The information you should include about both parties includes the full legal name, the full physical address, and either the driver's license number or a state identification number. The purpose of the driver's license or identification number is simply to help with identification purposes in the event of a legal dispute. A Massachusetts bill of sale should include the date that it was created. If the buyer will pay for the item on a different day other than when the bill of sale was created, the date of payment should also be included. 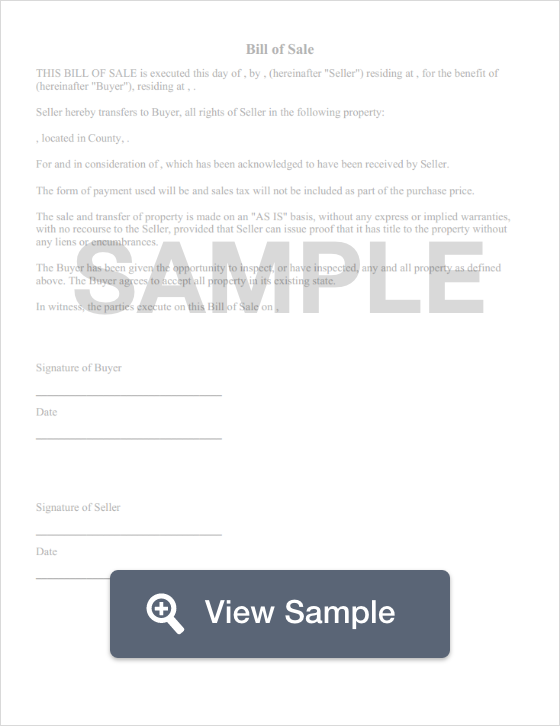 You should also make sure that you include the date that the buyer and seller both sign the document. Another good provision for a Massachusetts bill of sale is a seller's disclosure. In a seller's disclosure, you explain any defects that the item is known to have. Even if the defect is small, it should be listed. You could also mention whether the item is being sold as-is. When you mention the price of the item, you must first list it in words and then in numbers. For example, one hundred-fifty dollars and no cents ($150.00). Sometimes, items are given as a gift. That can be mentioned in a bill of sale. You should also list any other conditions that are associated with the transaction. Finally, a Massachusetts bill of sale should be signed and dated by both the buyer and the seller. In the next few sections, you'll learn how each of the most common bills of sale are used and how to describe the item being sold. A Massachusetts general bill of sale is used when you want to sell a common personal item that doesn't fall under the definition of a motor vehicle, boat, or gun. Common examples for a general bill of sale may include a desk, cookware, living room furniture, electronics, or a bicycle. When you describe the item in a Massachusetts general bill of sale, you should first determine if you have a serial, model, or registration number. If you have that, it should be documented in the bill of sale. If the item has a make or model number, such as would be found with a bicycle, television, or laptop, you should include that. You can also include descriptors such as the color or size of the item. For electronics, you can list specifics such as the size of a hard drive, whether there is a CD or DVD drive, and other related information. You should also list whether the item you're selling has any accessories, charging cables, or other included items. For example, if you were selling a handcrafted oak dining room table, you'd want to mention whether there is a leaf that will be included and if you will include any matching chairs. In the seller's disclosure, you'd want to mention if the item has any defects or flaws that you know about. Common flaws could include a nick, scratch, or crack. Remember to mention that the sell is as-is. Remember to abide by the Golden Rule. If you were purchasing something, you'd want to know if there was something wrong with it. When you describe a motor vehicle in a Massachusetts bill of sale, you should include the year, make, and model of the vehicle. You'll also want to document the VIN and the odometer reading. Depending on where you purchase the vehicle from, you may need to complete Form RMV-1, Application for Registration and Title. To draft a Massachusetts bill of sale for a boat, you'll need to include the year, make, model, and Hull ID of the boat. You should also list the length of the vessel. When you draft this document, you should mention whether or not the sale includes either a trailer or a motor. If the trailer is included, you'll want to list the make and the year. For motors, you'll want to list the year, make, and horsepower. When you draft a Massachusetts bill of sale for a gun, there are a couple of things to keep in mind. First, you need list the make, model, caliber, and serial number of the gun. Second, many gun transactions include a trade. If yours will include a trade, you should describe the item being traded. For trades involving guns, remember to document the make, model, caliber, and serial number of the gun being traded. Is a Massachusetts Bill of Sale Required to Register a Vehicle? Yes, if the vehicle is being purchased from a private party, you may need a Massachusetts bill of sale. The registration process takes place through the Massachusetts Registry of Motor Vehicles. You will also need to complete an Application for Registration & Title (RMV-1 Form). If the vehicle has a lien, you'll need to place the proper information on file. You'll need to provide the odometer reading either as part of the title or on the bill of sale. The bill of sale should also list the price. You should be ready to pay the sales tax and registration fee for the vehicle. Is a Massachusetts Bill of Sale Required to Register a Boat? Yes, registering a boat requires a Massachusetts bill of sale. If the boat is purchased from a dealer or business, the bill of sale must be written on company letterhead. For new boats, you'll also need a Manufacturer's Statement of Origin. You'll need to provide proof that your sales tax is paid. You do this by completing form ST-6 or ST-6E. To register your boat, you'll also need a pencil tracing of the Hull ID number, a completed registration and titling application, and be prepared to pay your required fees. Is a Bill of Sale Required to Register a Gun in Massachusetts? No, but guns must be registered with the Massachusetts Gun Transaction Portal with the same information that you would include in a Massachusetts bill of sale for a gun: the serial number, make, model, and caliber along with specific information about the involved parties). The Massachusetts Gun Transaction Portal also reminds registrants that you may need a PIN number (that you receive after you get a license for a weapon) as well as a reminder that you should not be involved in a personal sale to anyone who doesn't have the proper license. 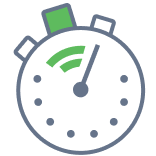 Create a free Massachusetts Bill of Sale in minutes with our professional document builder.